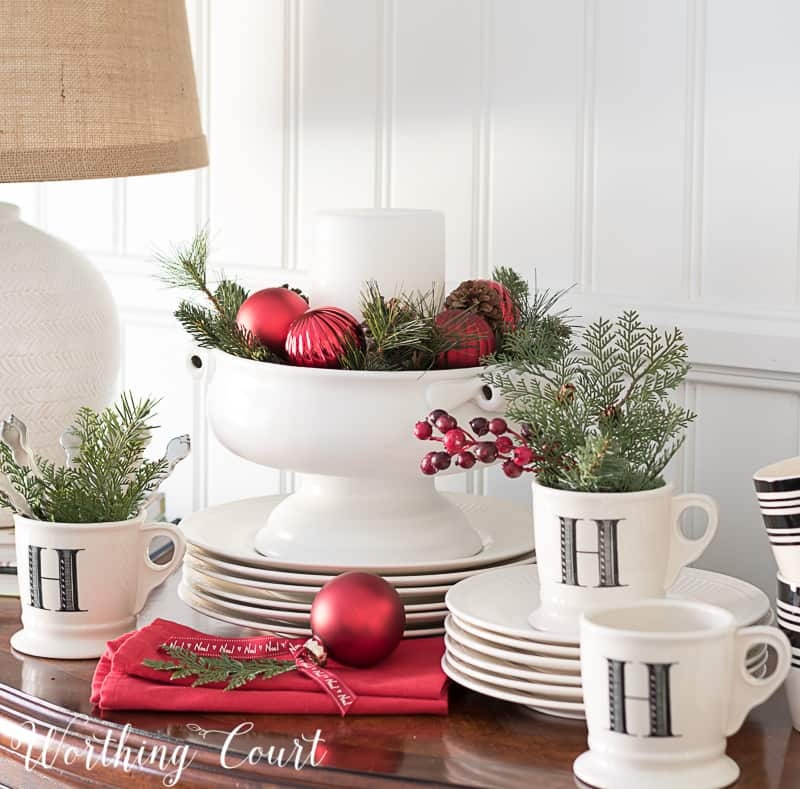 Get your dining room in the holiday spirit with this festive combination of red, black and white Christmas decor. In my dining room last Christmas, I was all about using neutrals and burnished golds, even though most of the rest of the house was decorated with red and green and plaid. I did manage to bring a little bit of red into the dining room with a Christmas tablescape that I put together, but the room itself was still heavily on the neutral and gold side. I suppose I thought that a dining room is supposed to be a more formal space in a home, so I figured my Christmas decorations in that room needed to reflect that. The problem was, the room didn’t go with the rest of my house. Nor did it project that warm, cozy and welcoming feeling that I want to surround my family and friends with at Christmas. So this year, I mended my ways. I listened to the room and it told me that it wants to have a more relaxed and casual style. It wants to blend in with the rest of the decorations in the house. So…out with the neutrals and out with the gold. And in with my Christmas’y red, black and white color palette! 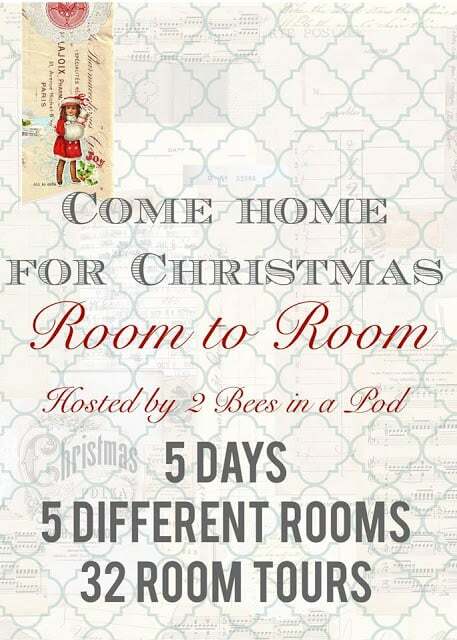 I’m really excited to be participating in the Come Home For Christmas Room To Room Tours hosted by 2 Bees In A Pod! Vicki and Jennifer have put together a wonderfully talented group of bloggers who are taking you through every room of the house this week. And today it’s all about Christmas dining rooms. Look for a list of of featured rooms and all of the participants at the bottom! Our dining room is located on the front of our house and has a full length bay window in it. One thing I knew for sure when we bought this house, is that there would definitely be a Christmas tree in that window! If you have sharp eyes, you probably noticed that there were no presents under the tree yet in the above photo. But there are now! I’ve been a busy shopping and wrapping bee and was finally able to add a few gifts over the last couple of days. 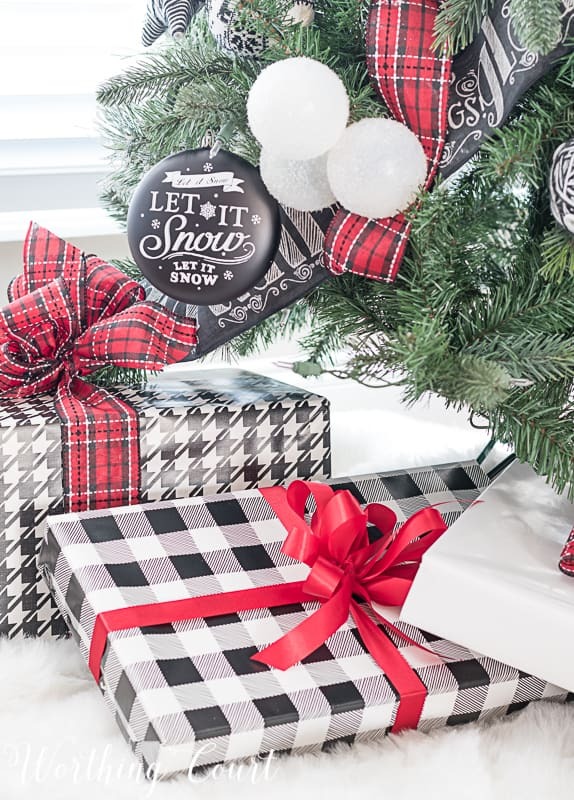 Using wrapping paper and ribbon that coordinates with the ornaments on the tree pulls the whole look together and I love it! Our diy cheater planked wall is the perfect backdrop for a vintage fireplace mantel top turned shelf, the sideboard and my diy Fixer Upper style hanging lanterns. This wall is the first thing that you see when you enter our dining room through the office (that used to be the formal living room until it got a complete overhaul). 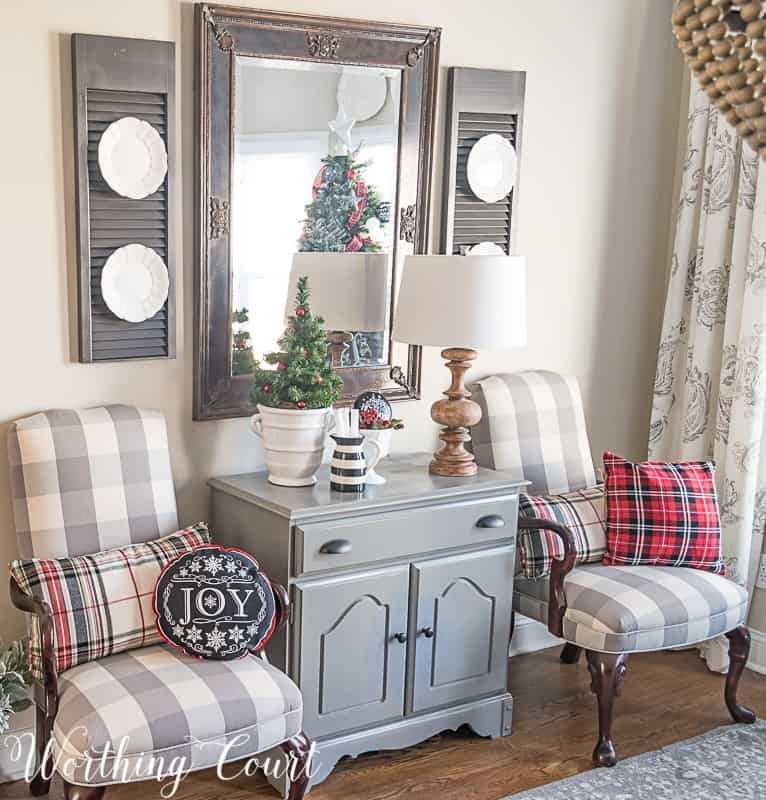 On the other side of the dining room, you’ll find a small painted chest flanked with two Martha Washington chairs covered with gray and white buffalo fabric. I had these chairs reupholstered to fit in with the color that I painted the rest of the furniture in the dining room with during its makeover. Change your vantage point and you pick up one of my favorite things – the reflection in the mirror above the chest. 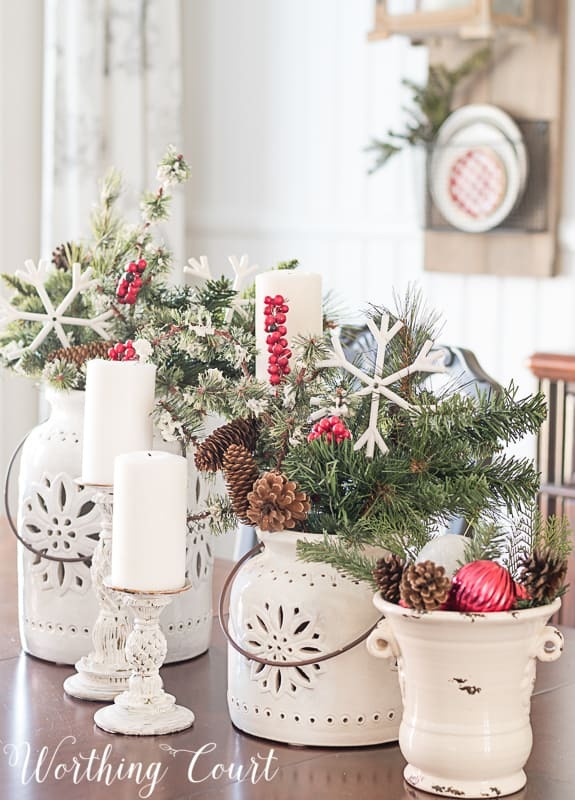 If you follow me on Instagram (you can do that by clicking right HERE), you’ll already know that using snowflakes in my dining room table centerpiece was wishful thinking on my part. We live in central North Carolina, so having a white Christmas is extremely unlikely for us. In fact, I’ve only had two white Christmases in my lifetime. So sad. Thank you for stopping by today! I’m soooo looking forward to our annual Christmas party when this room will be filled with family and friends and my table will be loaded down with yummy Christmas goodies! The whole room is beautiful, but of course I expected to love it if you decorated it. The black with the red, oh yeah, works for me! Sorry about no snow, if we get some I will gladly share, but save me some Christmas treats. Looks beautiful! So inviting. I love the more traditional red and green. It is exactly how I decorated this year. 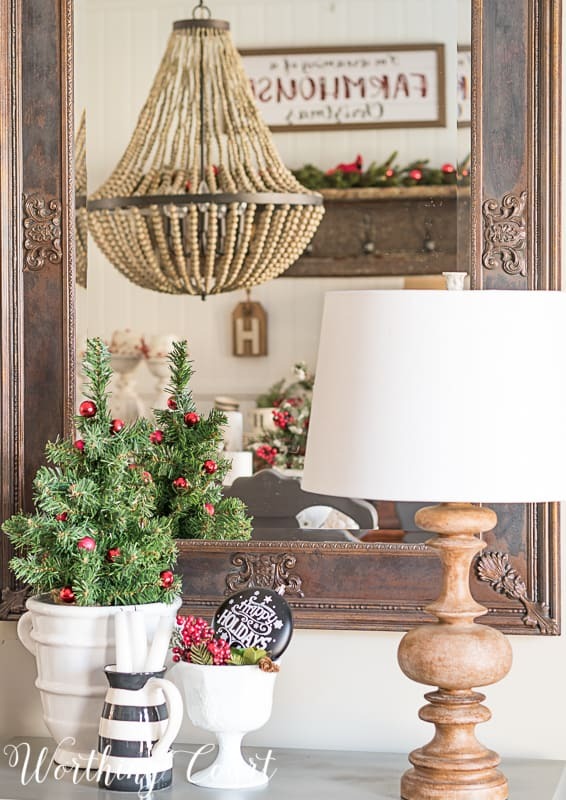 Love the way you decorated your dining room for Christmas! I’m sure all your guests will feel lucky to share the holiday experience in such a warm and inviting space. I am glad you listened to your dinning room. It is beautiful! Happy Holidays! Suzy, you definitely made the right choice! 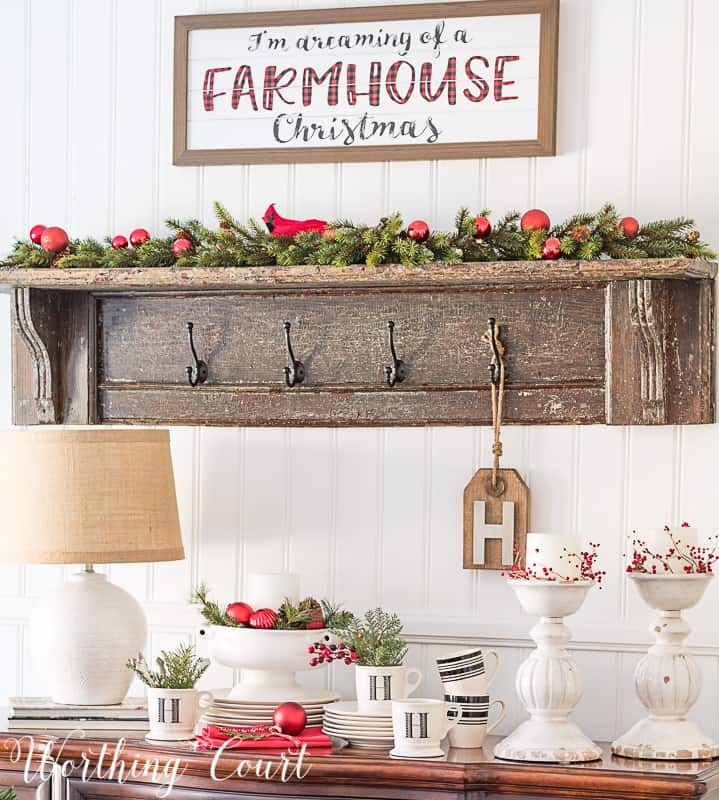 I love the farmhouse feel and the classic black, red and white decor. The whole room is simply stunning! I love it Suzy! It all looks so goo together!! Your dining room is stunning!!! I love the black and white with red touches!!! Such a cozy and beautiful space! I love all of the buffalo check and plaid! Ooh I just love your dining room! That chandelier is gorgeous, and your tree is so festive! Merry Christmas! Suzy, you outdid yourself! Your dining room is stunning. But I can’t take my eyes off the tree! I L~O~V~E it! Wow – your dining room is truly beautiful! The color of your furniture is perfect, and I love the reds you added this year. It’s gorgeous! Suzy, could you please post the details of the paint formula you had mixed for your dining room table that so beautifully matched the spray paint you used Rust-Oleum /Andonized Bronze. You have inspired me to get started on my dining room. Thanks. Hi Freda. If you’ll shoot me an email to worthingcourtblog@gmail.com, I’ll be glad to share the formula with you! So pretty and oh, so cozy! Your dining room looks beautiful! I love that you went back to the reds, whites, and blacks in the room this year – they look amazing! 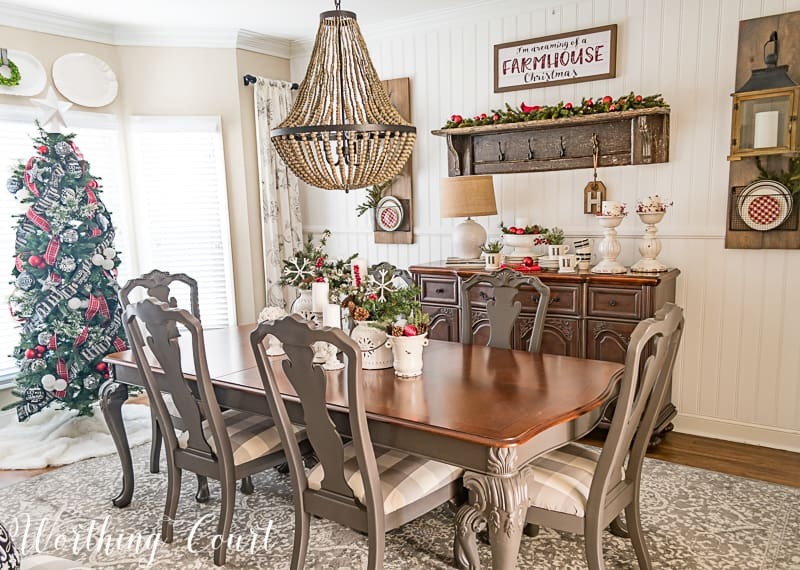 Your Christmas dining room looks beautiful Suzy! 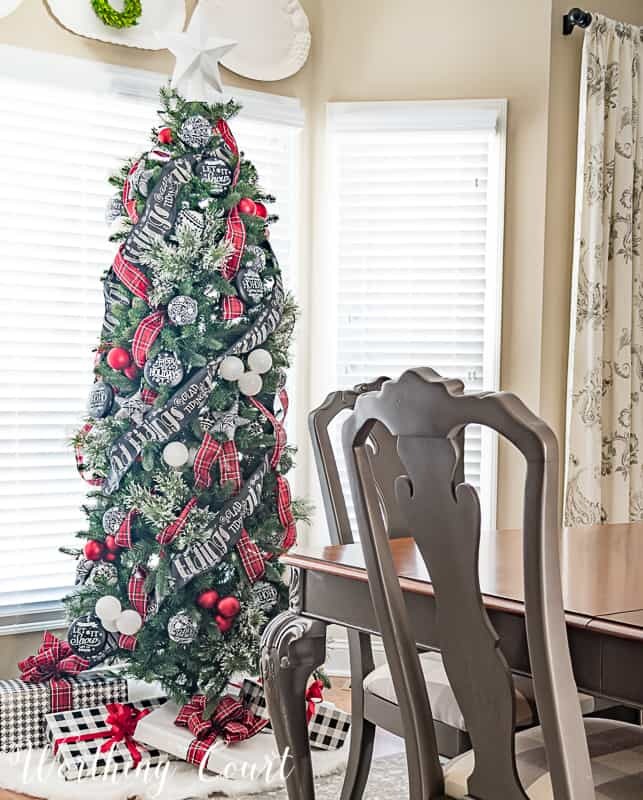 Love the red and how your decorated your tree! Your dining room looks stunning! And the tree is one of the prettiest I’ve seen this year! I absolutely LOVE your red, white, and black Christmas decorations! I scrolled back to the top just to look at all of your photos again. 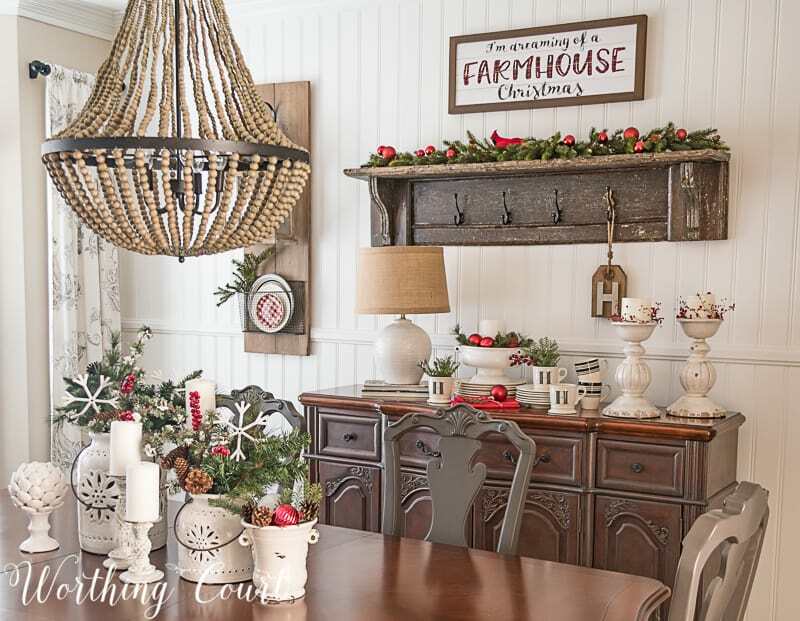 The simple farmhouse look really works in your formal dining room. The plaid pillows are perfect on your side chairs. Thanks for sharing! Love your use of black and red. Where ever did you find that cute ribbon and ornaments? Hi Beth. The wide chalkboard ribbon came from a local home decor store about three years ago, the narrower black, red and white ribbon came from a different local shop. 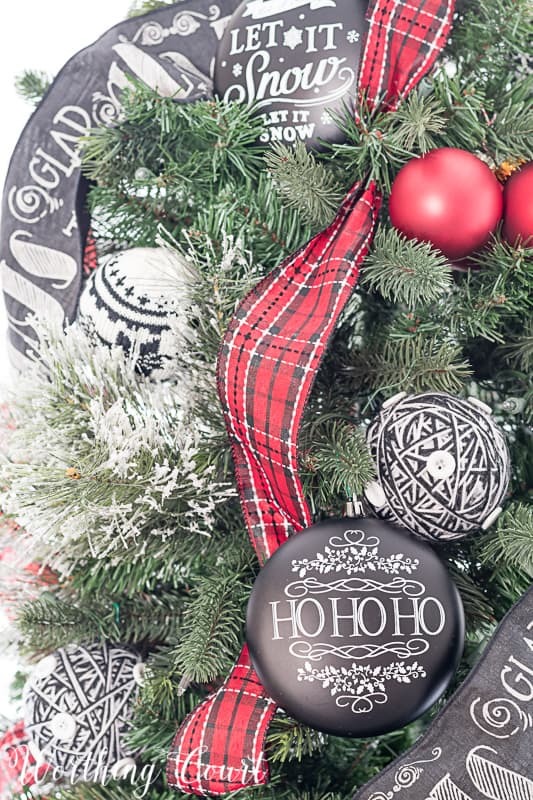 I assume that the ornaments you’re asking about are the round chalkboard ones??? If so, they came from At Home this year. Everything looks so, so pretty! I LOVE the whole room! Where did you get the slate colored script ribbon and ornaments? They are amazing! Thank you, Lori! The ribbon came from a local home decor shop about three years ago and the round chalkboard ornaments came from At Home this year. 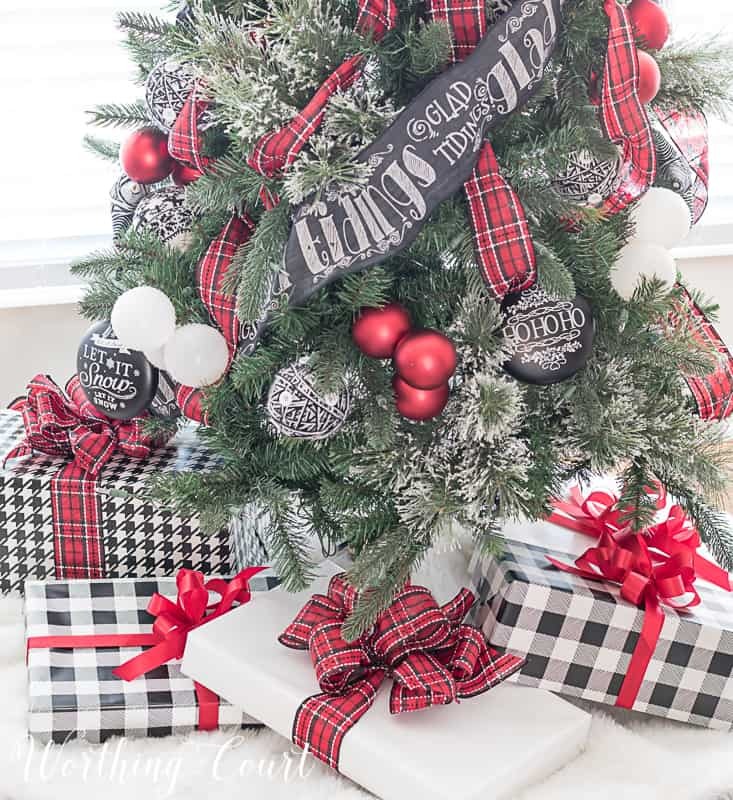 So beautiful… I love how the whole room comes together with red, plaid and black. Lovely! And, relaxed and casual is my favorite kind of style. Happy Holidays! You’ve definitely achieved the warm and welcoming look you were going for! I love all of your dining room decor, and I wish I had a bay window like yours so I could display a tree like this one! Where on earth did you find the ornaments? Hi Cheri. 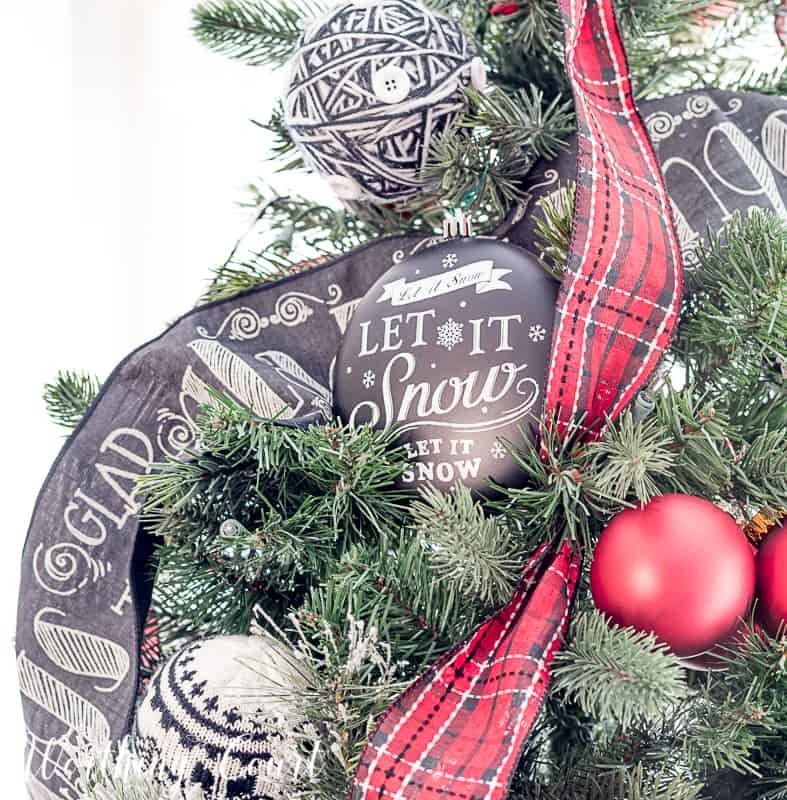 If you’re asking about the round, chalkboard ornaments, they came from At Home. Love all the rooms decorated and the little touches everywhere!, How long does it take to decorate? Hi Andi. Decorating this room went fairly quickly – I’d say it only took me a couple of days, working off and on. It’s gorgeous, Suzy! I love the pops of red mixed with the black and white! And that chandelier is giving me major heart eyes! 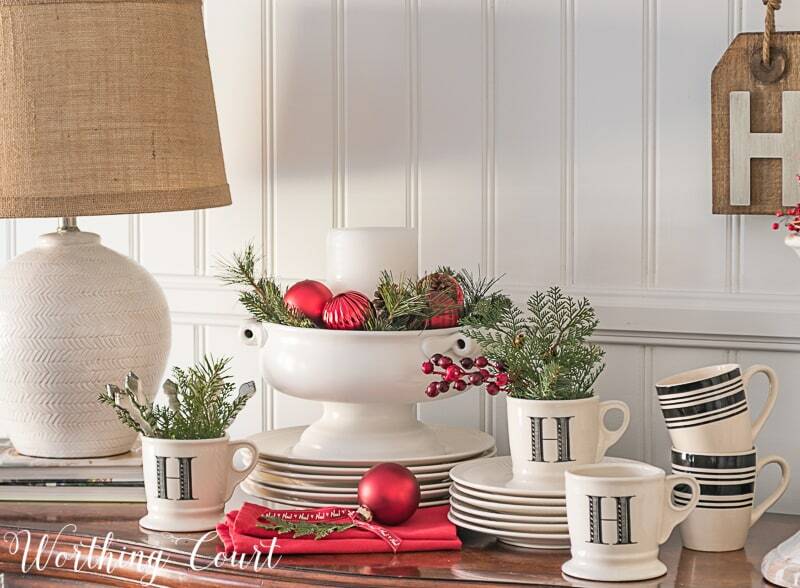 I love the white pots (pottery) on the table…where did you find it?